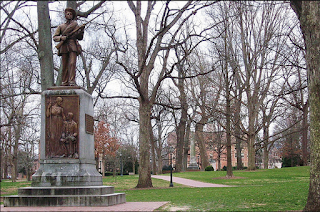 So a university built by slaves and free (well, free-ish, I suppose) blacks let a white supremacist [a fact genteely overlooked on his wikipedia page] dedicate a memorial to traitors in 1913 and hasn't had the decency to either tear it down? Or at least put a plaque on it saying something to the effect of, "A white supremacist dedicated this memorial to pro-slavery traitors here in 1913. Please feel free to desecrate it as you see fit"?